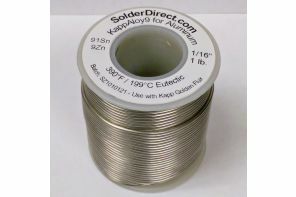 KappAloy9 Ribbon - .020" x .500"
KappAloy9™ Tin-Zinc solder is the standard for soldering Aluminum to Aluminum, Aluminum to Copper, and Aluminum to Brass. 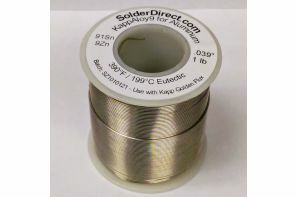 It is a soft, lower melting point Tin-Zinc solder eutectic at 390°F (199°C) offering good corrosion resistance and tensile strength. 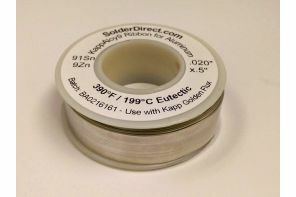 KappAloy9™ is designed to minimize the heat required while producing a consistently strong bond and retaining the physical properties of the dissimilar parts being joined. 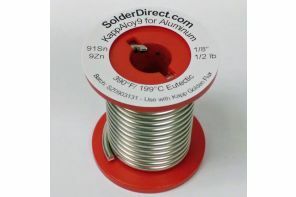 Its low melting point also minimizes the potential for heat damage to adjacent electrical/electronic components. Custom alloys and forms are our specialty. Call Kapp to discuss what size and diameter are right for you. Kapp Golden™ Flux has been designed specifically for soldering Aluminum to Aluminum and Copper. 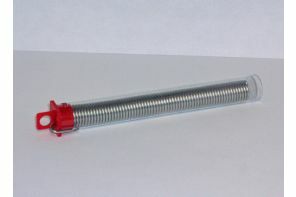 It is used on Aluminum to Aluminum or Aluminum to Copper wire pigtail splices, and for Aluminum to Copper, Brass or plated terminals and hot dip coating of Aluminum cable connectors to provide a low resistance contact surface. 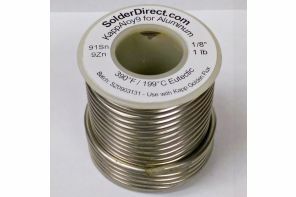 Residue is electrically conductive and slightly corrosive. Any flux residue should be removed with warm water or alcohol and a clean rag. Golden flux will char at temperatures above 550°F. DO NOT OVERHEAT FLUX.